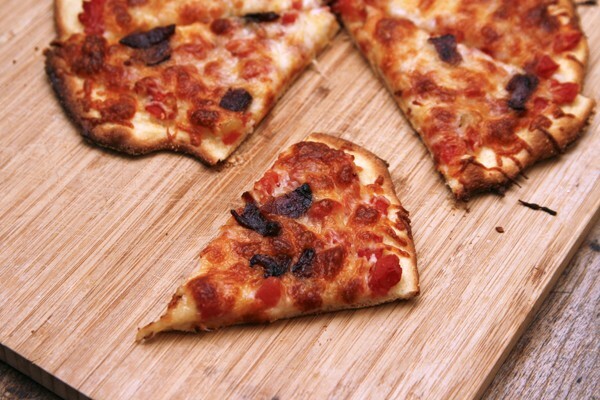 Get zesty with this easy homemade Tomato Chile Bacon Pizza recipe. Having lived in Connecticut for over a decade, it’s hard not to get swept up in the madness of college basketball championship games come March. I mean when your local women’s college basketball team wins seven of the 12 championships while you live in a state, it’s hard not to take notice. And maybe cheer a little. This weekend, the ladies from Connecticut will play in the quarterfinals — and yes, we’ll be cheering them on. And what does well with NCAA games? Pizza. To be fair, I think pizza goes well with just about any sports fandom endeavor. It’s a great shareable food, and perfect for digging into while you’re watching the game. But that’s neither here nor there. And this pizza? It’s good — and easy to make too. You start with pizza crust. I make my own, but store bought will work too. Work that pizza crust into a thin round and then prick it all over with a fork. A brush of olive oil comes next. 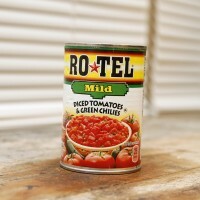 Then you spread it with RO*TEL Diced Tomatoes with Green Chiles (I use the mild ones if my kids will be eating too), a hearty amount of cheese and some cooked bacon. Then you bake it on a pizza stone to get that perfect, crispy crust. Slice it up into the familiar wedges, and dig in. 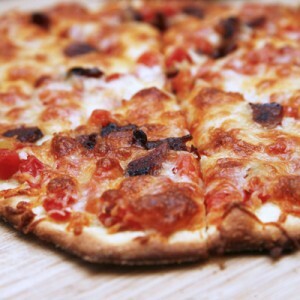 These tomatoes turn this pizza pie from pretty tasty to downright delicious with their combination of sweet and spicy. It’s zesty and a little unexpected. 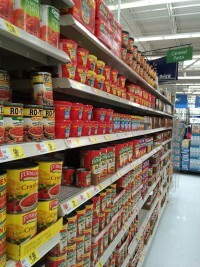 RO*TEL tomatoes can be round at grocers like Walmart … and be sure to print off the coupon before you go. It’s good through April 6, or while supplies last. What I love about using these tomatoes is the flavor that’s added thanks to the chiles in them. Whether you use the regular Diced Tomatoes with Green Chiles or the mild version, it adds something special to this cheesy, bacon-y pizza. 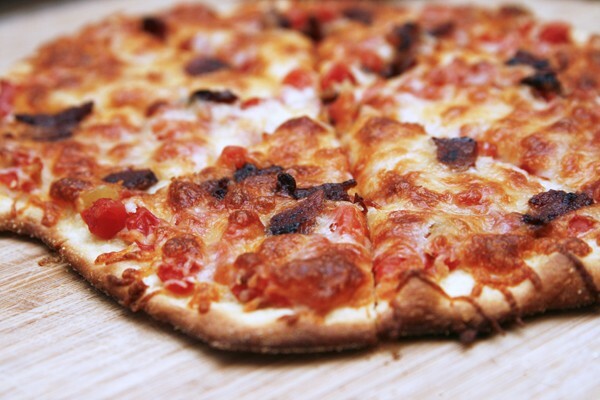 What do you like to dig into while watching the college basketball championships? Share in the comments below! Preheat oven to 500 degrees Fahrenheit with a pizza stone for 30 minutes. Sprinkle cornmeal on a pizza peel. Divide the pizza dough into two halves. Spread the first out into a thin 10-inch round. Prick all over with a fork. Brush gently all over with olive oil. Top with half of the tomatoes, spreading within 1/2-inch of the edge. Top with half of the cheese. Sprinkle with half the bacon. Bake for 10-15 minutes until golden. Remove from the oven and let cool slightly before cutting into wedges. Repeat with the second half of the pizza dough and remaining ingredients. Pizza goes with everything! Bacon is one of the most-requested toppings in my house…this sounds great! Soft pretzels, some kind of “dog”, and chips with dips are always good game day things around here, too. Any excuse for pizza is totally valid in my book. 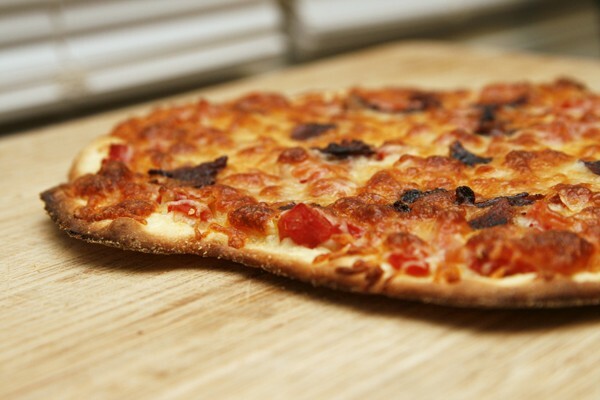 I love how thin and crispy your crust looks! Perfect! I never thought to add bacon to a pizza! You’re right pizza goes with any sport! And I love this chili bacon tomato version. And that crust! It looks amazing! Gotta try it!